Sounds familiar… This is the usual conversation between two players playing the game called battleship. I was introduced to this game by a friend when I was in the 7th standard. Since then, battleship has remained my favorite game. Battleship is played between two players. Each player will have a sheet of paper on which two 10 x 10 grids will be marked. 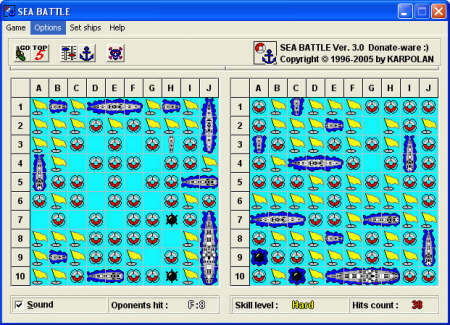 One grid is used to place one’s own ships and the other grid is used to mark the possible positions of the opponent’s ships based on the feedback given after the hits are announced. In the traditional battleship game, each player picks one cell and the opponent has to say “Hit” or “Miss” depending on whether one of his ships is in the position called out. If the shot is a “Hit” the player goes again until he/she misses and then the other player takes the shot. Once a ship is completely hit the owner has to say the ship is sunk and the name of the ship (for example, cruiser sunk). The three-shots-at-a-time is an advanced version of the game. The play continues until one player’s entire fleet is sunk. The usual configuration is one aircraft carrier (4 squares x 1 square), two battleships (3 x 1), three cruisers (2 x 1) and four submarines (1 x 1). There should be one cell space between ships. In the school we used to play battleship in the class, and during the intervals. We used ruled notebooks so that we don’t have to draw the horizontal lines. We used to play more than 10 games a day and didn’t want to spend too much time on drawing the grids. After sometime we started using carbon papers for drawing the grids to save time. This mode of play continued till we were in the 10th standard. Once I joined the college, for my pre-degree, battleship became low priority as preparation for the entrance examinations took the center stage. Once in the Engineering College, there were many friends who were similarly hooked to the game of battleship. We used to play battleship in the class, in the hostel, in the canteen and wherever we got an opportunity. To meet the increasing demand of the grid sheets, we used to cyclostyle hundreds of sheets at a time. The intensity of gaming will wane during the exam time and will be back with renewed vigor after the exams. When I joined TCS, I had to undergo an initial training program (ITP). During the ITP, while the teachers extolled the virtues of object-oriented programming and tried to teach us C++ programming, we used to formulate tactics for sinking the ships. We used to play battleship during all the boring classes, during the project time, and other free time. 3D Sea Battle – An excellent battleship game with several advanced features. Sea War – The traditional battleship game with stunning visual effects. i came here thru silverines blog.. this post will be useful for my boys..
read ur other posts.. im deeply touched.. Thanks for the comments. Yes it wil be interesting for kids (I read that they are 12 and 14 at your site). I recommend Sea War 2 if visual effects is the priority, and 3D Sea Battle if you want to customize the number of ships, size of the grid and so on.